I have the most unusual fondness for Woolworth's... I have only vague memories of going there with my mom while growing up in Alabama, but nonetheless they are fond memories... I remember eating at the lunch counter... well, I remember chocolate milkshakes at the lunch counter:) I also remember that they had a toy section with really inexpensive toys and if I was really, really good... I might actually get to take one of those prizes home. I remember it as "special time" with just me and my mom. My fondness for Woolworth's continues with my love of Nanci Griffith and her music... in her live recording of "Love at the Five and Dime" (she wrote it, by the way... not Kathy Matea)... she has a whole story about Woolworth stores. My favorite line is when she says "Woolworth stores everywhere smell the same... they smell like popcorn and chewing gum rubbed around on the bottom of a leather soled shoe".... She also reminisces about running across a Woolworth's in Europe and asking the driver to "stop the car and let me out so I can go fill up my suitcase with unnecessary plastic objects..."
Photo of a Woolworths from "Gone But Not Forgotten"
So I guess that's what the memory of Woolworth's represents to me.... unnecessary plastic objects, the smell of popcorn and chewing gum on a leather soled shoe... and the lunch counter with my mom. A while back, a family friend asked me if I had the recipe for Woolworth's cheesecake. I didn't even remember that they had a cheesecake, so I surely didn't have the recipe. Anyhow, that of course provoked me to launch an internet search for the recipe. Now I can't be certain if this is the actual recipe... there are a lot of them out there, but this is the one I tried. The first time I made it, I thought "wow... this is a LOT of dessert"... So invited some friends over and shared it with them. I kind of regretted it afterwards because it was so amazing. I especially like the graham cracker crust on this dessert, and I have since adopted this variation for every recipe I use that calls for a graham cracker crust. It is simply wonderful. Now while this is called "cheesecake"... it's really not. Not by a long shot... but it is really, really delicious. Light, refreshing, and addictive. The only modifications I made to this recipe was to add an extra 8oz of cream cheese... I substituted lemon extract for the vanilla... and I added 2 TBSP of lemon juice. It's that perfect "9x13 potluck dish"
2nd. Mix Jello with 1 cup hot water in small bowl, stir until dissolved and put in freezer for a quick set, you want it to thicken some but NOT set stir once about 20 minutes, then put in refrigerator until ready to use. 3rd. Mix graham cracker crumbs, powdered sugar, and melted butter until well blended, put 3/4 of it in bottom of 9X13 pan. Press to form crust, save rest of mixture for later. 4th. Mix cream cheese, 1 cup sugar and vanilla until well blended, set aside. 5th. When Jello starts to thicken it is time to start. Open can of evaporated milk and pour into large bowl and beat until fluffy and looks like whipped cream. Add cream cheese mixture until well blended, slowly mix in the jello, pour into pan, sprinkle with remaining graham cracker crumbs, refrigerate about two hours before serving, store covered in refrigerator. I am loving your blog...this, once again, sounds delish! What size can of evaporated milk does it call for? There are two different sizes at my store. I don't have a can at the house right now, but I think it's around 15 oz.... If I'm recalling correctly what my grocery store offers, there is a pretty small can, and then the larger can which is around 15 oz. Think somewhere in the 2 cup range:) Hope that helps! and it must be the regular evaporated milk, not the Evaporated Skim milk. The skim variety will not whip up stiff. That's good to know. Thanks! Although, when I bake, I never buy low fat, skimmed, reduced fat, reduced sugar, etc.... I mean, what's the point? ;) Thanks for reading. I worked at Woolworths in High School and have the recipe. Per the recipe I have it must be Carnation Evaporated Milk and its the large can. I ALWAYS keep one of the big cans of evaporated milk in the fridge just in case the recipe calls for cold milk!!! The evaporated milk ALWAYS makes anything it's used in taste so much richer!!! I remember Woolworth's well!! We had a Woolworth's on the square in downtown Charlotte, NC with a great lunch counter in their basement my mom always took me to when we used to go shopping!! This was long before McDonald's, and Burger King came to town as well as any malls either!!! Those were definitely the good old days!!! I have had this recipie since 1071 but didnt know it was a Wooworth recipie. It was always well received when it was taken to potluck meals. It is truly light tasting and refreshing dessert. I think it's the perfect potluck, picnic, bbq dessert, don't you? wow, you can still cook at your age? 944 yrs old. Growing up in the fifties, my mom and I would take the bus to downtown every Saturday.We would spend at least 2 hrs in Woolworths. I received a dollar and spent 1 hr looking and spending my dollar while my mom looked at pattern books,she loved to sew. Then we would go to the lunch counter and order grilled cheese sandwiches and a slice of cheesecake. Oh the memories, wish I could have one more Saturday. Just made this and am so happy. As a farm kid, it was a big deal that we would go to Woolworths after a trip to the dentist and my mom ALWAYS had the fluffy cheesecake and I remember her just swooning over it. She was an amazing cook and baker and I am thinking she just really loved anything someone else made. HA! I have been looking up recipes for this and was happy to see that yours didn't call for lemon juice like most do. It's perfect and nostalgic. Thank you so much. I also remember the Woolworth cheese cakes . Thank you for the recipe. I use to always shop at Woolworth's in Victoria BC. Canada . We use to stop and have coffee and n Orange Twist. It was like a cake doughnut but was twisted and had an orange glaze on it. Would love to find the recipe for them. Thank you for your post. Hi, have not responded to other replies, but had to comment on yours. My Mom (86 yrs) was a cook at Woolworths in Miami. She cooked everything. during a time when their food was made from scratch. I worked at the snack counter and remember my days hand-making the pizzas, the subs, and the awesome ice cream sandwiches made out of wafers. a). I remember as a teen, asking Mom to help me make the cheesecake. We made it at home. Delicious, but I really worked hard to whip that milk, LOL. b). I have been trying to find the original recipes, because I lost my original Woolworths cookbook in a move. Mom has shared as much as she remembers, but we were just talking about the Orange Twists. She said with all the oranges in Florida, somebody should be selling them. Not remembering the exact recipe, she says the oranges were "ground-up" and added to the dough. She says when she made them, she removed the seeds, other cooks left them in. She felt the seeds made them bitter. I have scoured the internet, Pinterest and other sites for this and other recipes. Am also on the hunt for another original cookbook. Such great food memories!! I use to shop @ Woolworths in Calgary AB as a kid with my dad & grandma, always a treat to sit at the counter for lunch. Making this recipe again, love how light & tasty, so easy to make. I remember this, we uses to go to Woolworths for lunch in High School, it was 2 blocks away we always had the cheescake : ) Than-you for this happy memory from my past now I can share it with my family. This sounds like the pie that my aunt used to make and bring over to the house when I was a kid. It was almost a custard, but not a custard; almost a cheesecake, but not a cheesecake. It was light and fluffy, and just melted in your mouth. I have to make this soon and see if it's the same. I really hope it is, because now I'll have the recipe! I have been looking for this recipe for ages--thanks so much! will try your version with the extra cream cheese and lemon..hope it turns out! If you add another 8 oz block of cream cheese do you also double the sugar and vanilla? Can't wait to try this! I didn't know this came from Woolworth's but my Grandmother made this same cheesecake but she would add an 8 oz. can crushed pineapple well drained - delicious! What great memories - my mother and I shopping at the mall in the 1960s and then stopping at Woolworth's to pick up unnecessary plastic things (LOL) and share a piece of lemon cheesecake at the lunch counter. Thank you for this trip down memory lane and thanks for the recipe. I too worked at Woolworth's here in Hawaii. It was fun place to work at; it was a one place shop. You really had to go anywhere else. Thank you very much for memories of the cheesecake. That was a very popular dessert. Thanks again. I am not a lemon person, was wondering if strawberry jello be used? I just made it with Raspberry and it was wonderful. I think you could use any kind of jello flavor. You might try lime jello. I have gotten brave enough to do so, cuz the original is so good. Hi, I too worked the Woolworth lunch counter all through high school back in the early 60's. This dessert was a big hit with the customers!! The recipe is pretty much "on target"!!!! The only thing I do different is to put the can of evap milk in fridge overnight. Whips much better when it's cold!! I worked the Christmas rush at Woolworths in Helena, MT. First time I had ever tasted cheesecake... I loved it. So when I finally had 'real cheese cake I think I was disappointed it wasn't Woolworths! When the lunch counter at Woolworths went away, I was sad, and have always longed for that taste. And, now I can make it myself. Thank you! I remember that delicious cheesecake when I worked downtown Houston, TX in the early '70s. I'd always go there during my lunch hour just for the cheesecake. Great Memory!! Foley's made a date bar that was so delicious, but I have been unable to find any info on it. Would appreciate if anyone has that recipe. Thanks for your light cheesecake recipe. I'm going to try making it lighter in calories by subbing alcohol sugars (erythritol or xylitol) and less-fat dairy products. 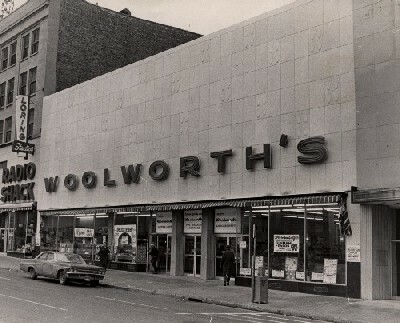 I also remember shopping at Woolworth with my mother in the 50s and 60s.. Unfortunately, I never tried this cheesecake, and the store always smelled of burnt cheese from (very marginal quality) pizza that we'd have pieces of for lunch. Does anyone know where this was. The storefronts always had "F.W. Woolworth". Woolworths, with no apostrophe, was in the U.K. Wollco was in Canada. I'm finding very few photos with Woolworth(apostrophe)s.
I live in Canada and we had both a Woolworths and a Woolco in our small town. Both long gone, sadly. I, too, worked the Woolworth's Store in Helena, MT in 1975, loved, loved, loved the Cheesecake, (and the lady who made it)! Thank you for the recipe and the memories connected with it! I also remember this recipe as a Philadelphia Lemon Cheese Cake recipe my mother had close to 50 years ago. This treat was always special and my brother would request my mom to make it for his birthday cake. Still does and he's pushing 60. Light, airy, delicious. A classic! The weight of a stick of butter is 4 ounces... not sure what the gram weight is.... And yes, it is a no bake recipe! I drive by our old Woolworths every day and think about going there often growing up in St. Paul, MN and eating at the counter and doing alot of shopping there as well. The old store has been sitting there empty since it closed way back in the day. I do miss it!! I'm excited to try this recipe. I am the only one in my family who likes cheesecake, but I am thinking if I don't SAY it has cream cheese in it they won't know the difference and LOVE it . I think the heavy texture of real cheesecake is also an issue with at least my daughter. One time my adult son was eating cake with cream cheese and loving it until his aunt mentioned what was in it - his fork went down and that was it for him. Go figure! By the way, our old Woolworths was vacant for many years but now has lots of offices in it. When we first moved here 38 years ago we took both our young children there for the experience of eating at the lunch counter! Not long after it closed. A sad day. YES, YES, YES! I INHERITED THIS, IN HAND-WRITTEN FORM FROM MY MOTHER WHO USED TO MAKE IT AT HOLIDAYS. SHE TOO DOUBLED THE CREAM CHEESE! MADE IT A BIT "STURDIER," AND DELICIOUS. BEING SICK TO DEATH OF ANYTHING "GRAHAM," I NOW MAKE IT WITH EITHER VANILLA WAFERS, OR; BELIEVE-IT-OR-NOT, RITZ CRACKERS! JUST ADD SOME SUGAR TO THE MIX. DELICIOUS! BE SURE TO CATCH THE JELLO BEFORE IT REALLY SETS OR, YOU'LL GET LITTLE JELLO-BITS THROUGHOUT THE SET "CAKE" NOT A DISASTER, BUT, NOT AS NICE AS SUPER-CREAMY. I worked at the restaurant in Connersville, In and the cheesecake is the one recipe that I'd tried to remember but couldn't! Thank you so much, this is wonderful!! My mother was a cook at Woolworths years ago . Store was in Wausau, Wi.. She always made this cheesecake years ago.After the store closed, she still made it for us, she most likely is still making it in heaven now. GOD BLESS HER.!!!!!!!!! I prefer it with 2 bricks of cream cheese... If you love cheesecake, then I would certainly recommend increasing the cream cheese in this recipe! My family has had this recipe since my sisters worked at Woolworths in the late 60's, early 70's. Its the best cheesecake by far. Try it you will love it. Its been a tradition for birthdays or holidays every year. I too worked there in 1962 as a junior in high school. I later became an assistant manager of the lunch fountain and made the cheesecakes there. A little different, but sounds like it all comes out the same. WONDERFUL memories. Thanks for that! So you used 16 oz of cream cheese and 2 TBSP lemon juice plus 2tsp of lemon extract instead of vanilla. Could you please clarify. So you add another 8oz of cream cheese for a total of 16 oz.Then you sub 2tsp of lemon extract for the vanilla. In addition you also put in 2 TBSP of lemon juice. Is that right? Can't wait too try,it bring a lot of fond memories growing up as a child. I made this yesterday to take to my friends for lunch after church. I took a copy of the story from Woolsworth because I used to eat there (never dessert, I felt lucky to get the cheeseburger and a coke). This was a huge hit. All eaten. I used cinnamon crisps for the crust and 2 blocks (8 oz.each) of cream cheese. Thanks for sharing! I made this 2 weeks ago with 8 oz. cream cheese. I also added 2 Tbs. of fresh lemon juice with the 2 tsp of vanilla. I don't like regular cheesecake at all, but this was the best dessert I have ever made or eaten, and I'm 66 years old, so I've seen a few desserts in my time. I made this 2 weeks ago with the 8 oz. of cream cheese, and added 2 Tbs. of fresh lemon juice with the 2 tsp. of vanilla. I don't like regular cheesecakes at all, but this was the best dessert I have ever made or eaten, and I'm 66 years old and have made and eaten plenty of desserts in my lifetime! It is so nice to read the comments that remember going to Woolworth's for lunch with our Mothers (and also with my Aunts). Makes me miss them and wish we could go back and do it again. This is my mom's cheesecake I have made it for years since her death. The only thing she changed was she use vanilla wafers instead of the gramcrackers just lay them whole on top and bottom. I worked at a Walgreen's lunch counter at newly opened mall in the late 60s and they also had a cafeteria named the Harvest House. I certainly remember the fluffy cheesecake and I'm happy to get this recipe. What I am looking for now is their recipe for their Dump Cake. We used all the left over pies and, I believe, other desserts and made a wonderful cake that was so moist and delicious. If you have that recipe I would be thrilled to have it.